Elfen Lied Wallpaper: Already spring..? 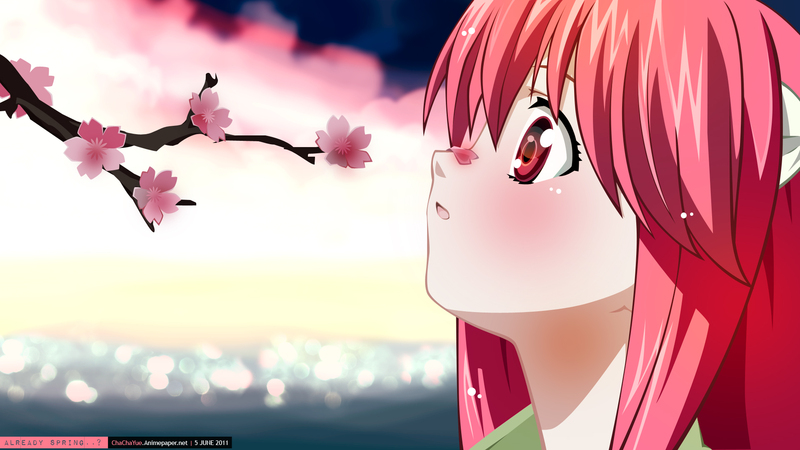 Minitokyo »	Elfen Lied Wallpapers » Elfen Lied Wallpaper: Already spring..? A wallpaper I've "re-walled", I made the original 4 years ago and it was submitted here at Animepaper.net, If you can't view I've also uploaded it here. Original wallpaper looks like this, and this is the screenshot. I must admit that this wall means alot, after all it is the first vector I ever made. But it looks so awfully crap now 4 years later so I can't really stand for the poor quality. So I improved the entire wall from scrach, only leaving the original idea. I made the vector smoother and finer, and using correct colours. This time I painted a little afterwards to make it more lively. I kept the background simple since it is the background after all, And bring out the feeling of a close-up to the vector parts. The original idea of a sakura tree became a simple branch. Everything except the dept-painting on Lucy/Nyuu is vectored really, minus the bokeh-effect and minor repairings in the edges from the gaussian blur. Very nice. You've really breathed new life into an old wallpaper. sorry ,i could't find the old one,but i do like this one! Her innocence is showcased really well here and I really enjoy that. Superb job on the vector and the crafting of the overall wallpaper (I love those tender looking cherry blossoms, awesome work on that aspect).